This is historically my favorite holiday; I hold many rich memories around Thanksgiving. For one, there is our big Detroit holiday tradition, the 90th annual America’s Thanksgiving Parade! I have it on the telly as I am typing. The actual parade hasn’t started as of yet, but I am already all warm and fuzzy inside from the coverage I’ve seen so far, because I’ve been watching it every year of my life that I can remember. All kinds of pleasant childhood memories are summoned, of waking up to my mother preparing a turkey and other Thanksgiving goodies with the parade on in the background. My family hosted Thanksgiving for a number of years. But the BEST Thanksgiving event my family enjoyed in more recent years was partaking in the other big Detroit tradition, the annual Thanksgiving day Lions football game! Thanks to one of my uncles, who I call UR (Uncle Rick! ), the extended family on my mom’s side was able to enjoy the big game in person for about 15 years, first at the Pontiac Silverdome and then at Ford Field downtown. I’m admittedly not much of a football fan, but I LOOOOVE football when it means eating and drinking glorious goodies in a suite! My generous uncle treated us well all of those years, and the day morphed into an all-day extravaganza, where I’d get up at 6:30 a.m. to get downtown by 9 for a mimosa-studded breakfast and parade viewing from the roof of my uncle’s loft; eat and drink more at the Lions game; and eat and drink even more at a post-game Thanksgiving dinner at my uncle’s bar. -Eating barbecued ribs as my Thanksgiving dinner for a few years at the bar, before the traditional Thanksgiving dinner entered the picture. -Mom spotting native Detroiter Tim Allen outside the suite next to us one year at the Silverdome and shouting, “There’s Tim Allen – hi, Tim!” and my dad then watching him through the glass partition dividing the suites throughout the game and making comments like “Tool Man’s getting frustrated!” when the play wasn’t going well (guys!). -Being in a suite next to former Detroit Red Wings Kris Draper and Chris Osgood and their families in 2012 (which became my time to try not to stare). -Various family members taking their turns at overdoing it on the adult beverages, including 2008 for me, when dinner culminated with me laying down across a few chairs in front of everyone (it was a long day, and I was tired!). 2014 was the last year my uncle took us to the football game. Last year, my immediate family didn’t go downtown, and we were all missing it hard – especially my mother, who is a longtime diehard Lions fan (if you know the Lions’ history, you know how admirable that is!). While UR isn’t taking us to the game this year, he is still generously offering the other components of the tradition: the pre-game brunch and the post-game Thanksgiving dinner at his bar for whoever wants to attend. So I’ll be jaunting down there and joining the rest of the family for dinner, and yay!!! to that. Thanksgiving isn’t the same for me when it’s not in the D.
But OK, the primary reason I am popping on today is not to blab on and on about my Thanksgiving memories – thanks for indulging me! 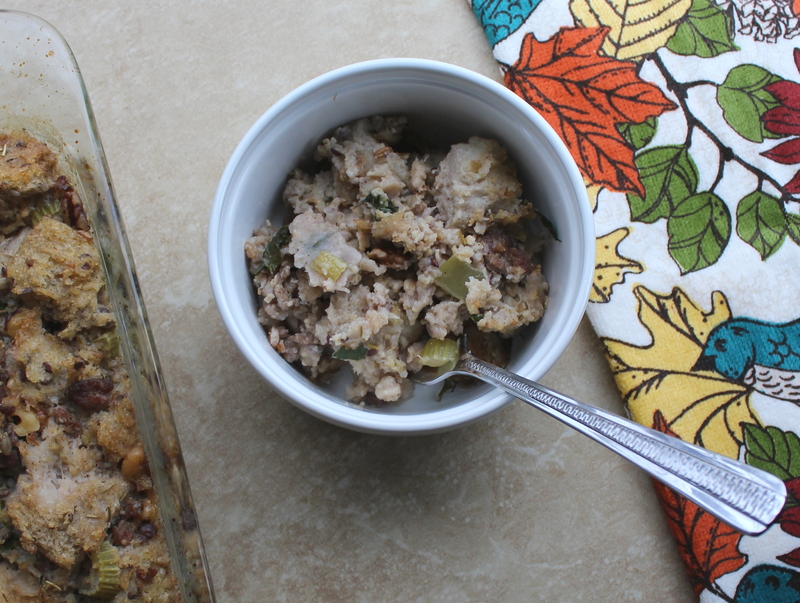 – but to post this Sausage and Walnut-Studded Stuffing recipe. Nothing like the last minute, right? I had hoped to get this up earlier in the week, but that just didn’t happen. Still, I hope the recipe will have relevance, because: a) I know a lot of people who don’t host Thanksgiving will still prepare their own holiday dinners this weekend so they have those delectable leftovers! b) Many people enjoy stuffing at other holiday-season get-togethers, such as Christmas, and c) This stuffing is just too damn good not to post! -Quality bread makes a difference. I used a seven-grain loaf and a rosemary garlic ciabatta loaf procured from an excellent local bakery, Natalie’s Bakery. -Sausage is DELICIOUS in stuffing! It lends a great savory flavor. And the walnuts add interest as well, introducing some nice crunchiness to the otherwise soft stuffing. -The bread blessedly soaks up more chicken stock than you may expect! I got over-zealous with my usage of chicken stock and dumped in all eight cups that I had available – then started freaking out when I remembered that I hadn’t wanted to use ALL of it. was able to remove some of it that the bread hadn’t soaked up – maybe a half cup’s worth. But there was still excess stock floating around the perimeter of the stuffing pan when I put it into the oven. I was prepared for failure. However, 30 minutes later, I removed the stuffing from the oven, and all of the stock was soaked up! I’d recommend adding seven cups of the stock to the stuffing mixture, then assessing it; if it seems soggy enough, stop there. But don’t be too alarmed if it seems overly soggy; remember that it will dry up in the oven, and moist stuffing is good stuffing! So, here we go to the recipe! The holiday season is officially here; happy cooking, eating, and bonding with family and friends! Preheat oven to 300 degrees. Distribute bread cubes evenly within a few oven-safe baking pans and let toast for 15 minutes. Add to a large mixing bowl when done. Increase the oven temperature to 375 degrees. Add loose, broken-up sausage to a frying pan and let cook over medium heat, stirring frequently, until fully browned with no pink remaining, about eight minutes. Add with the cooking grease to the bowl with the bread. -To a large pan, add the butter and let melt over medium heat. Add the onion and celery and cook for three to four minutes, until softened. Throw in in the walnuts and let toast for a minute or two. 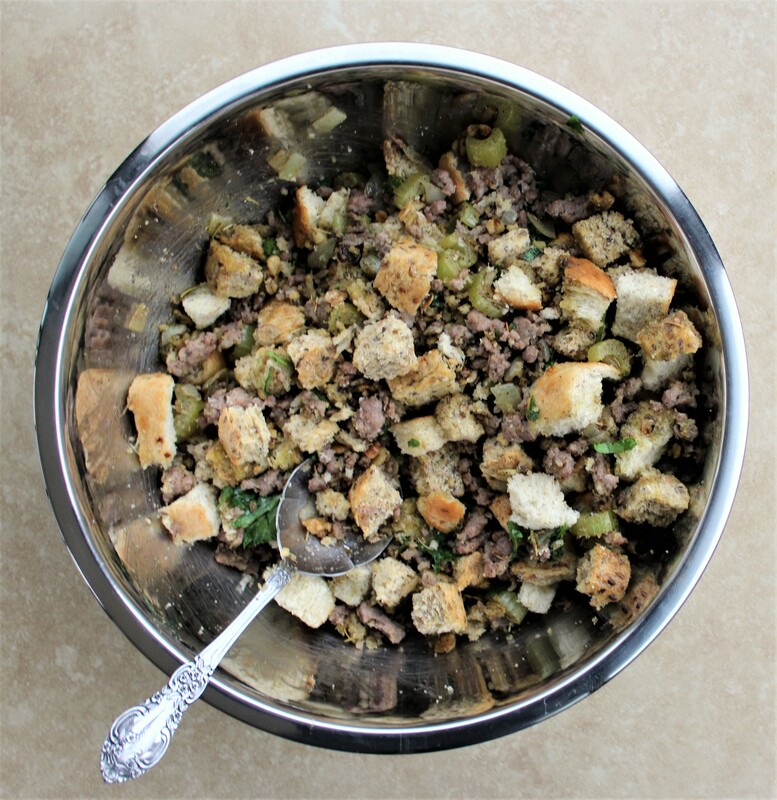 Then incorporate the spices and spoon all of it into the mixing bowl with the bread and sausage. Add the parsley and begin ladling in the chicken stock. Mix in the stock a few ladlefuls at a time, until the stuffing mixture is nice and soggy; as previously mentioned, you may not end up using all of the stock. 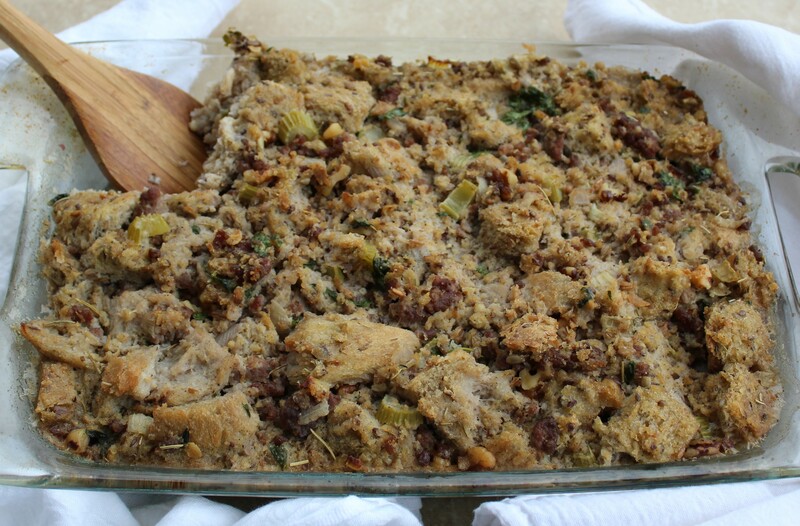 Add the stuffing to a 13 x 9-inch oven-safe baking dish and let bake until all of the stock has been absorbed and the stuffing is puffed up and has a nice crust, about 30 minutes. Then it’s time to grab the fam and chow down! Happy Thanksgiving!